Today was a long day for one of us. The plan was to head to the river to check on a sure spot and then head to a different lake for the evening Hydro Glow bite. We hadn’t been to this spot this year so we checked with the owner of the yard that we access it from if it was still okay for us to park by the gate. She was very pleased that we were asking, it’s important to appreciate your privileges to ensure that you’re able to maintain them. We were pleased to see that we were the only two on the ice that morning as we unloaded the truck. Our plan was simple, we were going to set up a few tip ups for pike in the shallows while we jigged the deeper water for crappie. We had seen plenty of big pike in this area in years past while fishing in the boat but we had never targeted them, we were hoping for a good one. As we set our flags, Bobby began to also cut out our search grid in the deep water for the crappie. When we’re trying to locate the school we usually drill and pattern of two along the channel edges, this allows us to cover a lot of water quickly. With all of our tip ups set we began jigging through the holes we had cut. The spot is typically very productive for insane numbers of crappie suspended throughout the water column. We have noticed though in past years that the more ice we get through out the course of the winter the water seems to get dirty and really cause problems. 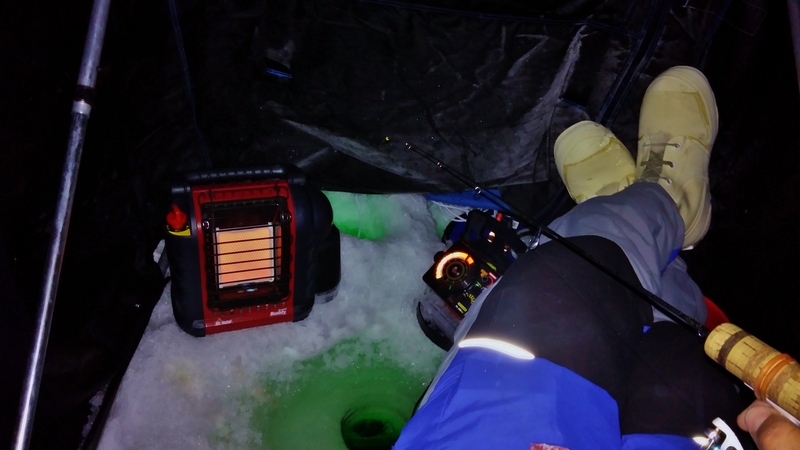 As it was this day, the majority of the fish we were marking and catching were within three feet of the bottom of the ice, and the fish we were catching were small. Finally Bobby hooked into something with some weight, it doubled his T7 custom rod right over. 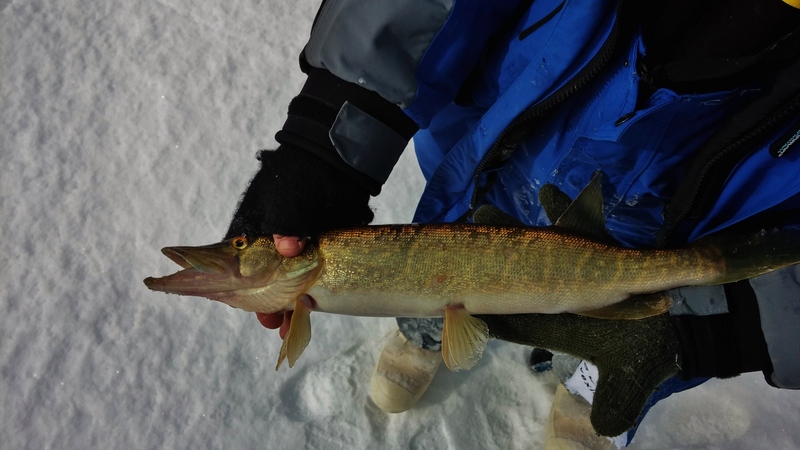 To our surprise we found a Pike/Pickerel hybrid on the other end of the line. We now know that this spot is an early ice spot before the water turns over in mid winter. While the morning bite wasn’t spectacular, I had high hopes that the night bite would be better. I was on the water for 4 pm headed to a spot that produced some crappie last year. Using Navionics, I found the 10′ depth that I was looking for. I hoped that I didn’t have to cut many holes so that the fish wouldn’t spook. My first hole was the winner fortunately. Dropping my Vexilar in, the weeds came up to about 6′ in 10′ of water. Wanting to see what the weeds looked like I dropped my camera down the hole. Before I reached the weeds, a red mark came shooting up and when my eyes switched to the camera, I confirmed that there were crappie were in the area. After getting everything set up, the sun was starting to set so it was go time. My first drop yielded a crappie immediately. Good start to the night so far. As time started to pass, the number of fish that I was both catching and seeing on the flasher was surprising me! It didn’t take long to key in on a pattern. I would catch crappie then a few shiners would come through. This pattern continued throughout the night. 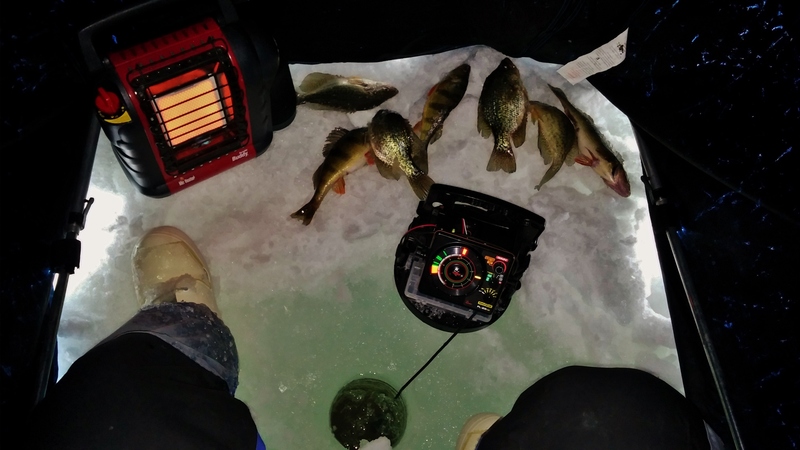 I found that the shiners were anywhere from inches below the ice down to a foot above the weeds while the crappie came anywhere from the bottom to the weeds tops. One of the coolest parts of the night was that when the crappie came in the weeds seemed to explode on the graph. They were super aggressive. At one point I had a lull in action until a big mark came it. It took about 5 minutes to get it to bite but when it did it started screaming out drag. To the hole and out again a few times we battled. 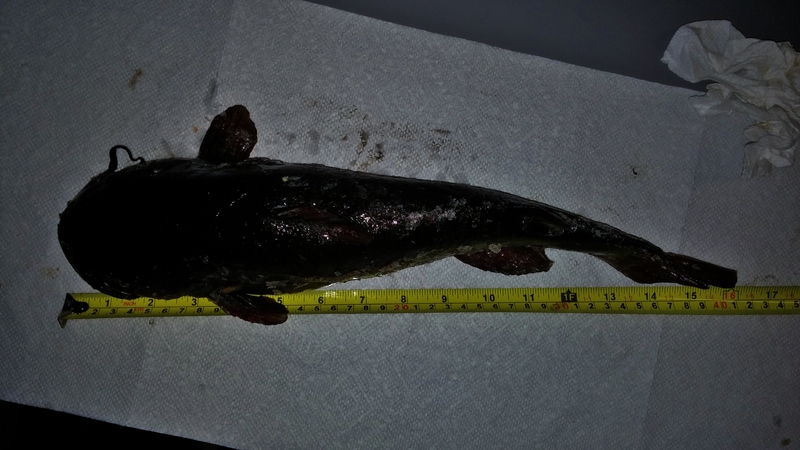 I figured it had to be a bass but I was pleasantly surprised when a 16″ bullhead came up the hole. Around 8:30 the fishing started to slow and just after 9 I decided to pack it in and head home for the night. 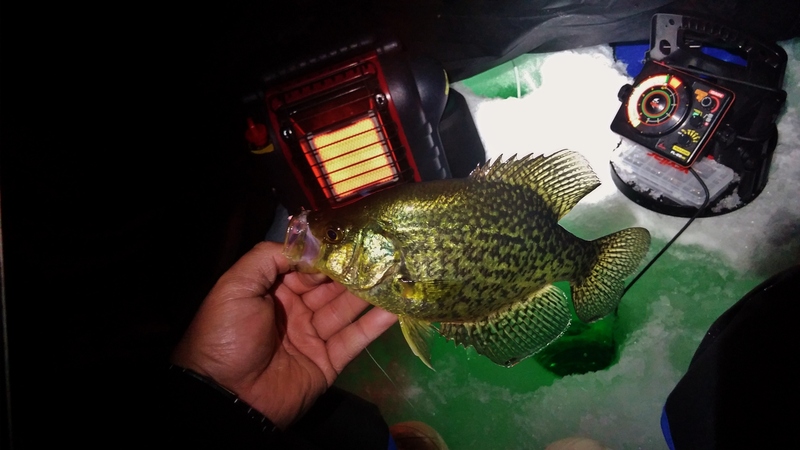 I had iced over 50 crappie, as well as some pumpkinseed and that bullhead.